The latest annual report from the solicitors ombudsman will be of interest to anyone who is unsure how best to go about recovering losses they have suffered as a result of a solicitor’s negligence. It has always been the case that a client who has lost out financially as a result of his or her solicitor’s negligence can make a breach of contract or negligence claim, through the courts if necessary. For many years however, victims of poor service from solicitors that had not caused any financial loss had no remedy. They were unable to seek redress through the courts, which deal mainly with money claims. Enter the solicitors ombudsman – also known as the Legal Ombudsman – in 2010, which deals with complaints about poor legal service, including complaints where poor service has not caused any financial loss to the client. 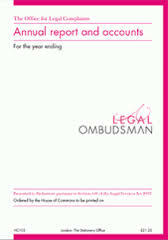 Its latest report reveals, perhaps surprisingly, that in most cases the ombudsman decided not to make a financial award to the complainant. Where awards were thought appropriate, most commonly the amount was low, at between £1 and £299. Contrast that with the value of claims against solicitors for breach of contract/negligence, the great majority of which are concerned with losses of over £10,000. Since the creation of the solicitors ombudsman, unhappy clients have more than one option available to them for resolving their complaints. Which method they choose depends on a number of factors, not least the amount of money involved, if any. Here at CAP LAW we help clients recover losses of over £10,000 from negligent solicitors. We specialise exclusively in claims against professionals, and in particular against solicitors.